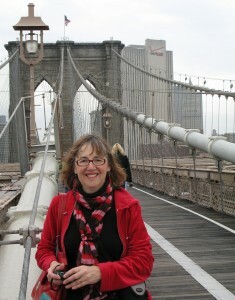 Frieda Wishinsky is the author of over sixty books. She writes picture books, chapter books, novels and non-fiction and is the author of the popular Canadian Flyer Adventures. Her books have been translated into many languages and have been nominated or won many awards internationally. JENNIFER JONES WON’T LEAVE ME ALONE won three English Children’s Choice awards and PLEASE, LOUISE! won the prestigious Marilyn Baillie Picture Book Award. EACH ONE SPECIAL was nominated for the Governor General’s Literary Award (Text) in 1998. Frieda loves speaking to kids and adults about the writing process and the joy of reading. 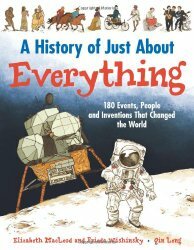 Ms. Wishinky’s latest book is A HISTORY OF JUST ABOUT EVERYTHING, non-fiction for grades 3 and up. She co-wrote it with Elizabeth MacLeod. My latest book, A HISTORY OF JUST ABOUT EVERYTHING was the biggest project I ever worked on and I didn’t even write it alone. Elizabeth MacLeod and I co-wrote the book and luckily we had an excellent editor, Val Wyatt who helped us organize our huge topic. I think our approach is a dynamic way of presenting history. We show how everything is linked and how events from the past ripple forward. We wrote the book in a conversational, easy-to-understand and fast-paced style. Both kids and adults tell us they enjoy the book (and learn a lot along the way). If we were watching over your shoulder as you work on a book, what would we see? Where do you work? What does your writing / illustrating process look like? I love writing in coffee shops. Maybe that’s because I grew up in New York City and like the hum and buzz behind me as I write. I also write at home in my office overlooking tall evergreens but I’m most creative when I’m out. I write by hand with a pencil (hooray for erasers) and then transfer the text to the computer. I revise by hand and then it’s back to the computer. I like to get feedback for my work and ask wise, honest yet supportive readers for their comments. Then I listen to what they say. I may not use everything, or change everything but I listen. I also believe that non-fiction should be presented as a story. After all, history is the story of everyone’s past. I have fun visiting schools, meeting teachers and librarians and my fellow authors. Book people are wonderful! Have any of your books been published electronically? If so, what was that process like? What sort of feedback have you had from readers? A bunch of my books have been published electronically, especially my Orca titles. I find I still sell way more books the old fashioned paper way. Maybe it’s the genre I write in. I don’t know. Top of my list would be my dear friend, Phoebe Gilman. I wish she were here to talk to and share work with again. I miss her. She always had insightful yet supportive comments. And I would have loved to meet William Steig. I love that he began writing kids books late in life. His writing and art are funny and so “true”. I do many school, library and conference presentations all over Canada and beyond. I love sharing writing ideas and books with kids and adults. My background in teaching and educational writing has been invaluable in connecting with kids, teachers and the curriculum. My talks are lively, interactive and curriculum-linked. I’ve also taught writing workshops and courses for kids and adults and offer one-to-one manuscript evaluations. In Song Lee and the “I Hate You” Notes, Mary has been staying up late. She is tired when she arrives at school and she is grumpy for most of the day. Everyone laughed but Mary. She was too busy biting and chewing on her braid. Her rotten mood was as mean and angry as the dark clouds gathering outside our classroom window. I could tell something bad was going to happen. I hoped it was just a storm. Doug’s intuition is correct. Not only is a storm brewing outside, there is one developing inside Miss Mackle’s classroom. Mary is upset with Song Lee and leaves two notes on her desk. Harry and Doug see Song Lee open the notes. They quietly retrieve the notes from a garbage can and read them. They are reluctant to “tattle” but they can see that Song Lee is upset. Harry speaks quietly to Miss Mackle and she is grateful for the information he provides. She has the perfect solution: she reaches for a picture book. Lovable Lyle by Bernard Waber has just the right message for Mary and her classmates. 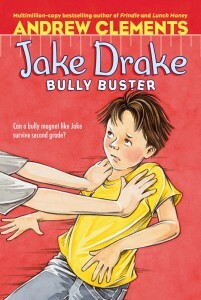 Best suited to children in grades two and three, Song Lee and the “I Hate You” Notes realistically depicts both the bully and her victim and encourages bystanders to get involved and enlist the assistance of an adult. When my boys first ventured into reading grade one chapter books, they were delighted to discover Frog and Toad by Arnold Lobel. Featuring a wonderful friendship and many happy adventures, the Frog and Toad series has been a favorite with young readers for decades. James Howe’s latest book, Houndlsey and Catina is very reminiscent of the Frog and Toad series. Howe is famous for Bunnicula (Today Vegetables… Tomorrow the World). Houndlsey and Catina will appeal to younger readers who prefer shorter, generously illustrated chapters and less text. It will likely suit a child reading at a mid to late grade one level. Illustrated beautifully by Marie-Louis Gay, Houndlsey and Catina tells of Catina’s desire to write a prize-winning book and Houndleys’ wish to win a cooking contest. Together, they help us see that being friends “is better than being famous.” This is a lovely tribute to friendship. Nate likes pancakes and syrup almost as much as he enjoys solving a perplexing mystery. Nate and his canine sidekick, Sludge, are called upon to solve all sorts of cases; locating lost paintings, disappearing dogs and, in one case, a missing key. With an appearance that is often reminiscent of Sherlock Holmes, Nate is all business – except if pancakes are on the menu. Along with Annie and Rosamond, our hero cracks each case with solid detective work. Nate the Great is a series that has been delighting young readers for more than thirty years. Suitable for children who are reading at about a grade two level, some of the stories are divided into chapters. Generously illustrated, the text is perfect for young readers who are ready to take on a meatier story (than typically found in easy readers). Series like these are great because beginning readers often decide they want to read every single one of the Nate the Great books. This is just what we want, a child who is motivated to read by fun stories and a delightful cast of characters. Nate the Great at Random House includes printable activities plus author information.